Background: Obesity is a growing pandemic. Bariatric surgery is the most effective means of treating obese patients, improving obesity related co-morbid conditions and increasing overall life expectancy. Nonetheless, substantial weight regain has been observed in a subset of patients following bariatric surgery. Objectives: To systematically assess the existing literature on the incidence and causative factors for weight regain post bariatric surgery. Methods: Electronic literature search of the Medline, Embase, and Cochrane library databases along with the PubMed US national library from January 1950 to April 2010 to identify relevant articles was preformed. Results: After an initial screen of 2072 titles, 1407 abstracts were reviewed and 1397 met exclusion criteria and were rejected. Nine studies were included in this analysis; 4 case series, 3 surveys and 2 non-randomized controlled trials. A total of 3560 patients were available for analysis. Weight regain appears to be multifactorial, although causative factors have not been systematically analysed. Etiologies are non procedure specific (psychiatric, low exercise levels, endocrinopathies, dietary non compliance) and procedure specific (pouch dilation, band slippage, bowel adaptation, fistulization). 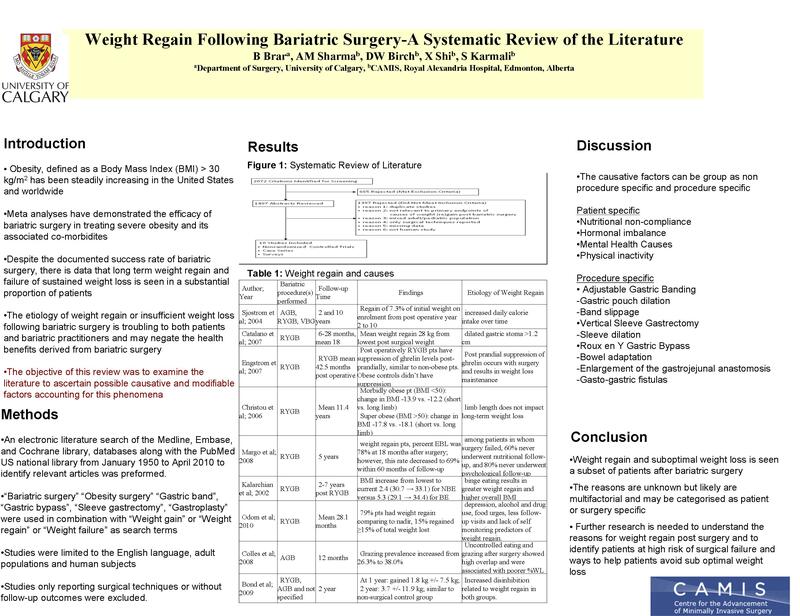 Conclusion: The incidence of weight regain following bariatric surgery is estimated at 8-25% but varies dramatically according to extent of follow-up and the procedure performed. The causes for weight regain may be multi-factorial and are related to procedure and patient specific factors. Further research is needed to identify patients at highest risk of failure and ways to modify this risk.